It’s a busy week and investors have plenty to digest. It’s been a volatile week too. Trading this market can make you feel like you were tossed into a washing machine stuck in the “spin cycle”. For one thing, earnings season is in full swing. This week alone, more than 25% of S&P companies will report fourth-quarter results. We’ve seen stocks such as Caterpillar (CAT) plunge on disappointing earnings. As CAT shares fell 9% on the disappointing report, the company blamed its subpar performance on a slowdown in China and on continuing trade tensions. Then there was NVIDIA (NVDA). The company abruptly pre-announced that Q4 revenue would come in significantly below forecast. NVIDIA blamed pretty much everything for the shortfall, and the stock was punished, dropping 14% earlier this week. But it hasn't all been "sour grapes". Boeing Co. (BA) handily beat revenue and profit expectations, and even guided higher for fiscal 2019. The stock surged 7% on the news, and shares are within a whisker of the previous all-time high, from early-October 2018. Even Apple (AAPL) managed to turn things around after beating lowered expectations. The company now has a staggering $245 billion in cash and plenty of dry powder with which to aggressively buy back its stock. Although shares in AAPL are down more than 30% from their peak, the stock jumped more than 5% on the earnings report. For sure, there’s been plenty of dispersion in stocks during earnings season. And we've seen some pretty whacky reactions too. To see what I mean (and speaking of investors being put through the “spin cycle”) have a look at the recent trading action in Whirlpool (WHR), the maker of washing machines and other home appliances. Whirlpool reported what are considered to be mixed results after the close on Monday, January 28th. The company beat earnings estimates by a wide margin, but missed on revenues. They also guided below consensus looking ahead. Confused? Look at the daily price chart in candlestick form. The stock gapped-down to $117.94 at the open. 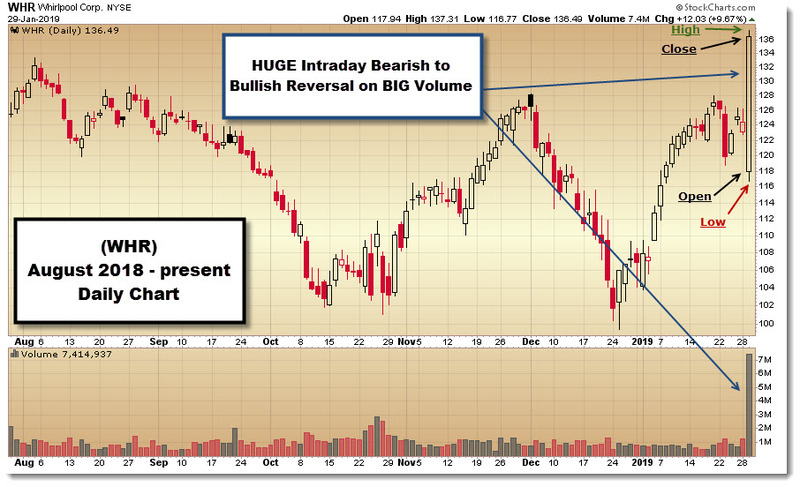 Then it hit an intraday low of $116.77 before a massive bullish reversal sent the stock screaming higher on volume that was more than seven times the daily average. The stock closed the day at $136.49, near its intraday high of $137.31. For many bullish and bearish traders, the intraday price action led to a real blood bath. Wait, what? Bullish and bearish traders got creamed? How? Well, the bullish traders probably got stopped out of their positions shortly after the stock opened on the gap down. For their part, the bears got tricked, as the stock abruptly reversed from a loss to a massive gain. I'll bet if you check "the tape" you’ll find a lot of short-covering carnage. The good news is that there is a smarter and better way to make a directional trade in an underlying stock. Just use options. Specifically, an options strategy called a vertical spread. 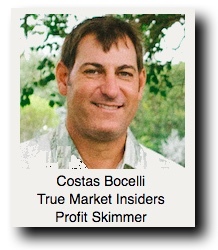 I use spreads almost exclusively for the trade recommendations in Profit Skimmer, my options trading service. One vertical spread trade I recommended recently generated a 150% return. I also teach the vertical spread strategy in Options Soup, our options educational program. It was designed to teach the greenest investor everything she needs to know about options in an easy to understand format. Limited risk and fully hedged positions. The vertical spread can even prevent you from getting “whipped” or tricked into bailing too soon on a stock that, had you waited, would ultimately have turned into a winner. My point is, if options are not a part of your investing toolbox, you’re simply making a terrible mistake. For a couple of actionable examples on applying the vertical spread strategy, let’s turn to Amazon.Com, which is set to report earnings today after the close. AMZN can be a good stock to trade. The problem for most investors is that it’s so expensive. The stock is currently trading around $1,650 per share, so an investor wanting to take a 100 share stock position would have to lay out $165,000. Even if you use a margin account to either go long the stock (bullish), or go short (bearish), you'd still spend more than $80,000. That might be too rich for your blood. However, you could buy a vertical spread and spend (risk) a small fraction of your capital. AMZN typically makes a big move following earnings. But how big? The options market is implying a move of about six percent, either up or down. That means that the stock can easily rise or fall by roughly $100 when it resumes trading on Friday. With the stock recently trading at $1,650, that upper bound is then $1,750 and the lower bound is $1,550. If you are inclined to make a bullish trade, you could consider buying the AMZN Feb 1700 Call while at the same time selling the AMZN 1725 Call. With the stock trading around $1,650 per share the Call Spread costs $9.00, or $900 per spread. That is your maximum risk in the trade -- what you pay for the spread. And if AMZN does have a positive reaction, and rises above $1,725 at expiration on Friday, February 15th, the spread would be worth $25.00, or $2,500 per spread. That's a return of 178%. If you're inclined to make a bearish trade, you could consider buying the AMZN Feb 1600 Put while selling the AMZN Feb 1575 Put. With AMZN trading at $1,650 per share, the Put Spread costs roughly the same as the Call Spread, $9.00 or $900 per spread. What you pay for the Put Spread is your maximum risk in the trade, no more. And if AMZN does have a negative reaction and declines below $1,575 at expiration (Friday, February 15th), the spread would be worth $25.00 or $2,500 per spread. That's a similar return on investment -- 178%. As you can see, we were able to create a similar risk-versus-reward profile using vertical spreads for investors that have a bullish view and for investors that have a bearish view. All you need to do is pick a side. 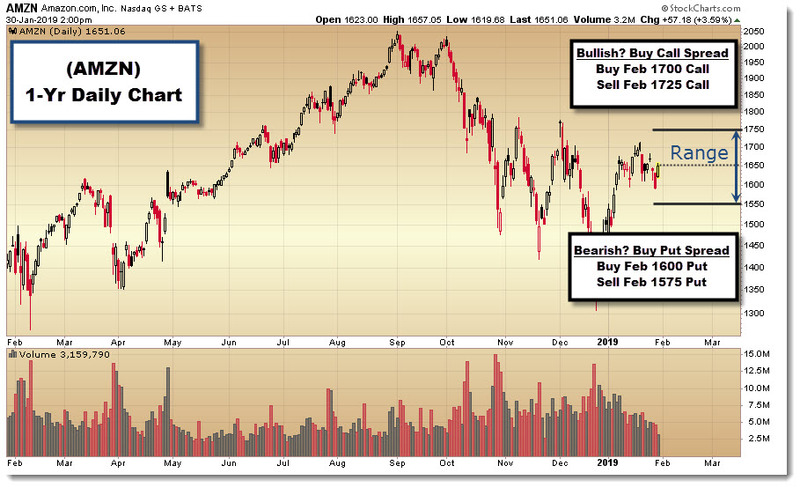 So, heading into earnings, are you bullish or bearish on AMZN? If you have a conviction, the vertical spread can be a great way to capture bigger gains while taking fewer risks.